The simplest way to add a picture to a contact is to have the image already stored in the Samsung Galaxy Note 3. You can snap a picture and save it, grab a picture from the Internet, or use any image already stored in the phone’s Gallery app. The image doesn’t even have to be a picture of the contact — any image will do. Touch the icon where the contact’s picture would sit, or touch the existing picture assigned to the contact. The icon shows a generic placeholder when no picture is assigned. Select how you want to create a new contact image. Image: Choose a photo you’ve already taken or one stored in the phone’s Gallery. Pictures by People: Similar to the Image choice, this item limits the selection to tagged pictures. Take Picture: Use the camera right now to snap an image of the contact. S Note: Use the S Note app to create a contact image. If you choose the Image option, continue with Step 4. If you choose to take a picture, use the phone’s camera to snap the picture. Touch the Save button, and then skip down to Step 6. Browse the Gallery to look for a suitable image. The next step is to crop the image so that only the portion relevant to the contact is presented. If you see the Complete Action Using prompt, choose the Crop Picture item. The Crop Picture item is related to the Gallery, which is the traditional Android photo-management app. Drag the blue rectangle to include the portion of the image you want for the contact. Touch the Done button to crop the image and assign it to the contact. The image now appears whenever the contact is referenced on your phone. You may also see pictures assigned to your contacts based on pictures supplied on Facebook or other social networking sites. Some images in the Gallery may not work for contact icons. For example, images synchronized with your online photo albums may be unavailable. To get rid of the contact’s existing picture, edit the contact. 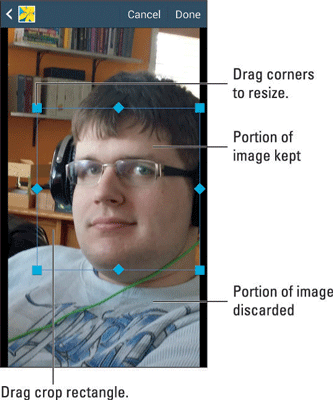 Touch the image and choose the Remove command. You cannot remove or change images for contacts linked from social networking sites.